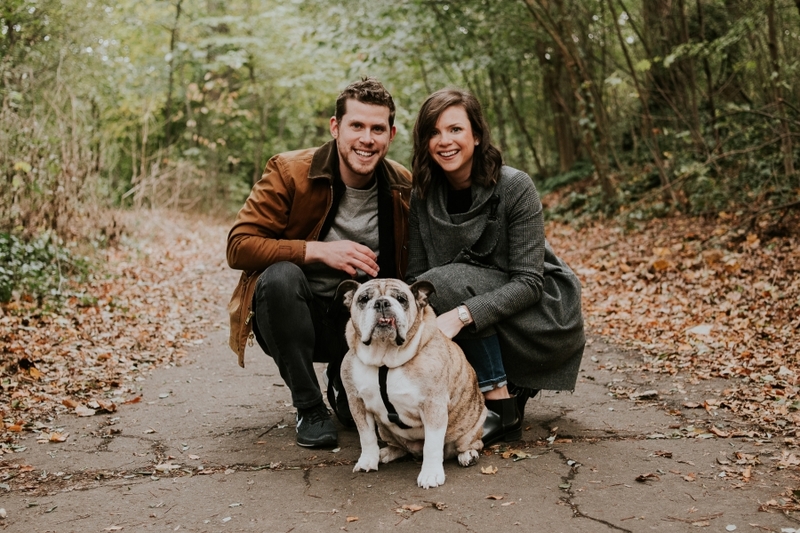 Lilly the 9-year-old English bulldog and her parents completely won over my heart when we met up for a sunset session in Prospect Park. As a human belonging to a 10-year-old pit mix, I have a very soft spot in my heart for all the bully breeds, especially seniors! The love Tristan and Tracy have for Lilly was tangible. When we got started, Lilly was able to walk around slowly with frequent rest stops. 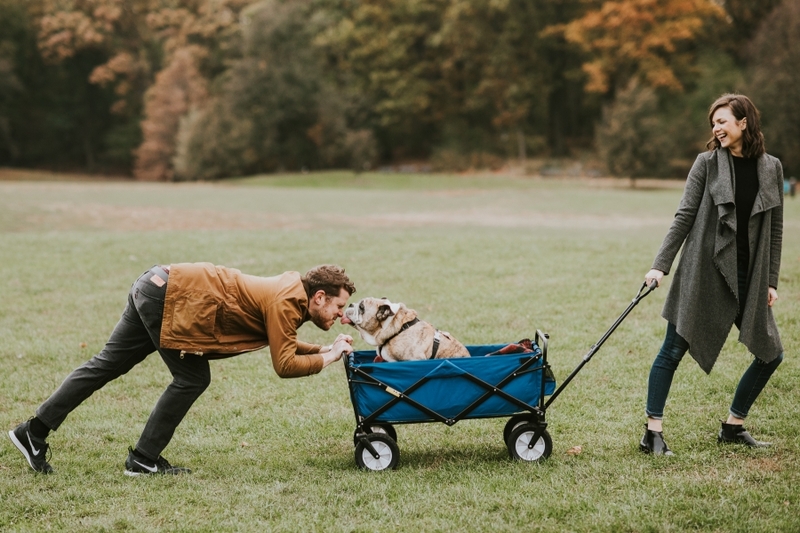 Toward the end of the shoot, it was too hot and humid for her to trek around, so she got to ride in her little blue wagon while we walked from spot to spot, and it was just one of the cutest things I’ve ever seen. What a lucky gal! One of my absolute favorite tidbits of this shoot was that Tristan (Lilly’s dad) took a little while to realize that I personally am COMPLETELY in support of anyone totally obsessed with their pet, free of any negative judgment whatsoever. He eventually admitted that friends have teased him in the past for being so inextricably linked to his dog, so attuned to her needs and so caring about making sure that she’s comfortable! The first newborn session I did with the T family was in 2015, with their baby girl Bianca. In 2016 they welcomed a second daughter, Valentina, and invited me over again! Using a much different shoot strategy, and with the help of one of the world’s sweetest grandmothers, we snapped some really fun newborn/family/holiday card portraits! The session was scheduled for about a week before they were relocating to a different state, so this would be their last photo shoot in NYC 🙁 So we made sure to get plenty of shots with their very-NYC view from the living room – dad especially loved the water tower, so I tried to make sure we could see it in the shots! Towards the end of the session, we enlisted grandma’s help getting the girls into their holiday outfits. Scroll down for the one they chose for a card! Lauryn and Steve’s maternity session was a race against time! When Steve emailed me, Lauryn was so close to her due date that he asked if I’d be willing to shoot the portraits in the hospital, because she was scheduled to be induced early and they were playing it one hour at a time. Maternity sessions are really special because a family is about to grow. They’re usually quiet, relaxing shoots mainly due to the fact that soon-to-be moms are taking it easy for the final stretch. When there’s an 18-month-older sibling, the energy is WAY different – Akshay kept us on our toes! Gina and Justin braved the winter chill for a quick engagement session at Pier 64 in Manhattan. The water and snow made a beautiful backdrop, and if I had to guess I’d say their love and frequent hugs kept them warm!